India 7-331 (Shikhar Dhawan 114, Rohit Sharma 65, Ravindra Jadeja 47*, Ryan McLaren 3-70) beat South Africa 305 (Ryan McLaren 71, AB de Villiers 70, Jadeja 2-31, Bhuvneshwar Kumar 2-49) by 26 runs. India plundered 331 runs for the loss of seven wickets in the allocated 50 overs and South Africa was sent back to the pavilion for 305 in 50 overs. Shikhar Dhawan (India) was declared ‘Player of the match’ for his brilliant hundred. The ICC Champions Trophy, first match of Group B, was played on Friday, June 6, 2013, at Sophia Gardens, Cardiff. Earlier, AB de Villiers, the skipper of the Proteas, won the toss and sent the Blue Shirts in for batting. Rohit Sharma along with Shikhar Dhawan got off to a nice start by scoring 53 runs with 1 six and 6 sixes. Sharma was the most aggressive of the two and hit 1 six and 6 fours until the 14th over as Dhawan got 4 boundaries and added another two in the next over. Rohit Sharma attained his 14th ODI fifty in the 17th over and Dhawan followed him three overs later. The opening partnership was broken at 127 in 21.2 overs when Sharma lost his wicket for 65 off 81 with 1 six and 8 four and was replaced by Virat Kohli. Shikhar Dhawan kept on playing his shots and the boundaries were flowing from his willow regularly. He smashed his first ODI hundred with two back to back fours in the 32nd over as Kohli became the next victim at 210 after scoring 31 runs. Dhawan tried to keep up the pace and was finally gone for 114 off just 94 balls with 1 six and 12 fours. The third wicket fell at 227 in 37.3 overs as the Proteas bowlers struck twice and the Blue Shirts reached 5-260 after 41.4 overs. The Indian captain, MS Dhoni, along with Ravindra Jadeja kept on the pace and took the score to 291 before the first was caught by Faf du Plessis off Lonwabo Tsotsobe for 27. Jadeja played a brisk unbeaten knock of 47 from 29 with 1 six and 7 fours as India amassed 7-331 in 50 overs. Ryan McLaren was the chief wicket taker with three, Lonwabo Tsotsobe got two whereas Jean-Paul-Duminy claimed one wicket. South Africa lost an early wicket at 13 when Robin Peterson joined in with Hashim Amla. 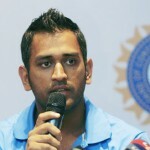 The latter hit 3 fours in the fourth over before he was caught behind by Dhoni off Umesh Yadav for 22. AB de Villiers walked in next as Peterson hit 4 boundaries in the coming overs and kept the score board moving. AB de Villiers made his contribution by hitting 5 fours in the following overs and the score went past the hundred runs mark in the 14th over. Peterson achieved his maiden ODI fifty in the 18th over and de Villiers posted his 33rd half century three overs later. The partnership was dislodged at 155 in 24.3 overs when Robin Peterson was run out while trying to take an unnecessary run for 68 off 72 with 6 fours. Jean-Paul-Duminy scored just 14 runs when he was declared leg before wicket off Ravindra Jadeja and the decision of the field umpire was retained by the third umpire even after a review. The South African batmen showed some urgency and a couple of wickets fell within two overs. AB de Villiers was caught by Jadeja at forward square leg for 70 off 71 with 7 fours and David Miller ran himself out for a duck. Faf du Plessis and Ryan McLaren tried to consolidate as the latter hit 3 fours in the 35th over. 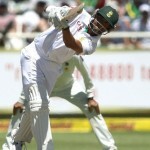 The duo added another 5 boundaries and enhanced the score to 238 in 37.3 overs when Faf du Plessis surrendered for 30. The Proteas lost their 9th wicket at 257 in 42.5 overs as the last batsman, Morne Morkel, appeared in the park. Ryan McLaren took over the game and hit 1 six and 2 fours in the 44th over and completed his first ODI fifty with another four in the very next over. He stood firm at his crease with a breezy knock of 71 off just 61 balls comprising 1 six and 11 fours as the entire Proteas team was bowled out for 305 in 50 overs. Bhuvneshwar Kumar, Umesh Yadav, Ishant Sharma and Ravindra Jadeja shared two wickets each whereas two batsmen were run out. India started off well in the tournament while clinching the match by 26 runs and earned two valuable points.